The council is proposing the permanent closure of Coptic St between Little Russell Street & Streatham St. Similarly to Museum St last year, this would be in place starting on Car Free Day (Wed 22 Sep 2004). Little Russell St (between Museum St & Coptic St) would change from 2 way to one way westbound. 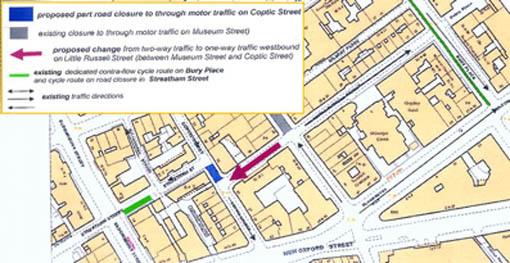 The entrance to Coptic St (at the Gt Russell St jucntion) would be narrowed to deter larger vehicles from using Coptic St. In conjunction with this years International Car Free Day 2004, Camden Council is proposing to close a small part of Coptic Street WC1 (between Little Russell Street and Streatham Street) on 22nd September 2004 to through motor traffic on a permanent basis -see map below. This closure would be almost identical to last year’s closure of part of Museum Street to through motor traffic which was launched on International Car Free Day 2003. Approximately 15% increase in the number of people walking along Museum Street since the Museum Street closure (with more than 100 people an hour in the early weekday aftemoon) – this increase in walking benefits local businesses, improves community safety, and the quality of the environment. A fall in some traffic pollution levels of around 30%. Prevent motor traffic from driving through this area, and instead, encouraging it to use main roads. The scheme would still allow motor vehicles to access local residential properties and shops from other parts of Coptic Street. It would help make Coptic Street a more pleasant place for residents, shoppers and visitors, with improved air quality and less traffic pollution and noise. It would be a further step towards improving the pedestrian route between Bioomsbury (especially The British Museum) and Covent Garden. Other improvements to this route will be the provision of new pedestrian signs in the next few months to further encourage walking between Covent Garden, The Bntish Museum and certain tube stations. Increased levels of walking should benefit local shops in Coptic Street. Since the road closure in Museum Street more people are walking here and anecdotal evidence already suggests that this has encouraged rriore people to use the cafes. By encouraging more people to walk between The British Museum and Covent Garden, via Princes Circus, Coptic Street and Museum Street, unnecessary crowding at some nearby tube stations may be reduced. Please note that the introduction of this scheme may fesult in the relocation of some residents’ car parking bays to nearby streets where space permits. Access will be maintained across the road closures in Coptic Stfeet for fire and other emergency services via removable bollards. It is proposed that the closure will commence on 22nd September 2004, on International Car Free Day. The Council would also like to hold a small street festival on this day to launch this measure. This will include a number of fun activities as well as some exhibitions on green transport. 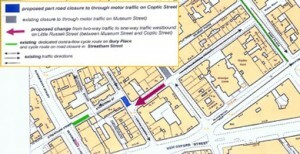 The one-day festival will require a wider closure of the Coptic Street area, from New Oxford Street to Great Russell Street, for one-day only, after which the permanent motor traffic measure would be implemented. We would also like to hear your views on the one-day festival. We support the closure, but strongly object to the 1 way street which is neither desirable nor necessary. CCC is opposed to one way streets in principle on a number of grounds which the council is well aware of (see here). In this instance if the road remained 2 way very few motor vehciles would use it eastbound due to the closure and existing one way in Coptic Street. However the new one way would unnecessarily force cyclists travelling through the closure onto the busy New Oxford St/Bloomsbury Way road system. Finally, not installing this one way street will reduce street clutter as several one was signs and no entries will be avoided. We will only support the Car Free Day event if the one way proposal is dropped.